The U.K. celebrity chef has risen to the pinnacle of the culinary world—while taking a fresh talent management approach in her kitchens. Restaurant kitchens are notoriously macho workplaces. From the grueling scenes in Anthony Bourdain’s book Kitchen Confidential to the prolific swearing in Gordon Ramsay’s TV show Kitchen Nightmares, the kitchen has become synonymous in pop culture with a Darwinian style of leadership. The weak are sniffed out and quashed in the quest for perfection. Ms. Smyth is happy to leave behind celebrity chef stereotypes. She is mild-mannered and chooses her words carefully. And she shies away from controversy. When she was named Best Female Chef at the World’s 50 Best Restaurant awards gala in Spain last year, Ms. Smyth accepted the prize graciously but admitted to finding the category “strange,” since gender plays no part in the job of a chef. Her measured ambivalence, even as many of her peers vocally criticized the category as sexist, signals her modus operandi. Ms. Smyth is unapologetically ambitious, but she is not here to ruffle feathers—she is here to cook. And maybe redefine her industry at the same time. Raised in rural Northern Ireland by a farmer and a restaurant waitress, Ms. Smyth has worked in some of the world’s best kitchens: Le Louis XV in Monaco, The French Laundry in California and Per Se in New York. She catered Prince Harry and Meghan Markle’s royal wedding. 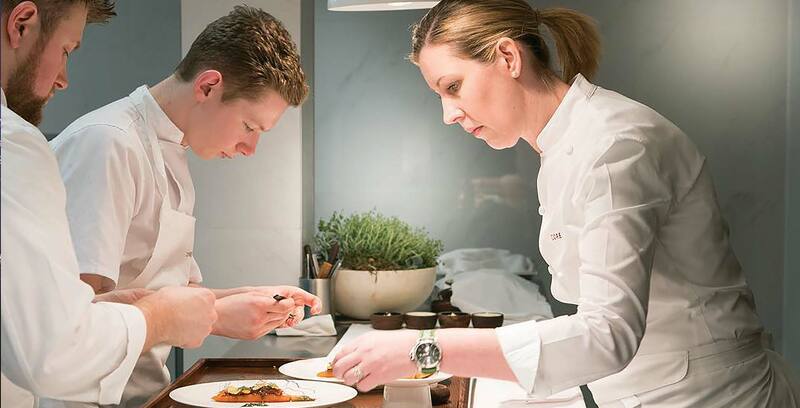 But her first solo venture, Core by Clare Smyth, is making Ms. Smyth’s biggest imprint on her industry. In London’s Notting Hill neighborhood, the cozy spot was named Best Restaurant at the GQ Food and Drink Awards last year. It received two Michelin stars in 2018, just one year after its opening. But Core distinguishes itself beyond food and accolades. It is proof that a restaurant can excel with a leadership style that cuts against the industry’s grain. She regrets her own management style at the start of her career. She was just 28 when she took the helm at Restaurant Gordon Ramsay, then the only three-star restaurant in the country. “I was under tremendous amount of pressure. I felt that I had big shoes to fill and that I really had to prove myself in that role,” she says. She has decided to lead her own kitchen in a more gentle manner. “I grew up a little bit and realized that you could do it differently,” she says. Culture has shifted since Ms. Smyth started, both in broader society and in the kitchen. The #MeToo movement has shone a light on how male-dominated workplaces, including restaurant kitchens, have penalized women and held them back. Among the more high-profile cases was Chef Mario Batali, who announced the closure of his restaurant La Sirena in New York City after being accused of sexually harassing and abusing women who worked for him. Female chefs are more motivated than ever to drive a change in kitchen culture, and Ms. Smyth says their male colleagues are right there with them. Constant burn-out affects everyone and has contributed to a widespread skills shortage in the culinary world. “There’s not going to be a future for our industry unless we move forward,” she says. With Core, Ms. Smyth hopes to offer an example of how to do so. For one, there are multiple women in the kitchen. “Having a good gender balance basically just makes a better working environment. It’s much, much healthier,” she says. It is clear from the Michelin stars that she demands excellence from her team. Dishes are checked multiple times before they are served. Quality control is a major component of the job, as is constantly pushing boundaries and trying new recipes to keep the restaurant on top. But Ms. Smyth has also dialed down the heat in the kitchen, putting the pressure on herself instead. She sees it as her job to equip staff with the tools they need to constantly improve and innovate. Every week, someone is tasked with researching a topic related to food and restaurants and presenting their learnings to the team. The front-of-the-house staff also hosts a daily training with subjects that vary along monthly themes. Such a dedicated focus on training is uncommon, Ms. Smyth says, with just a few restaurants around the world operating this way. “Everybody complains about our industry having a skills shortage, and the only way to fix that is to do something about it,” she explains. When hiring, Ms. Smyth looks for individuals who will fit well into the culture she has built. She wants them to respect not just her, but each other, the guests and the food being served. Like all companies, restaurants thrive when the team is cohesive and works well together. For Ms. Smyth, part of that is recognizing the humanity in the people she hires. She invites them to have fun and to bring their personality to the kitchen. They might cook a meal from their childhood or their culture as a way of sharing a piece of themselves with their peers. The kitchen at Core operates on a rotation, with people working at one station for three to six months—until they have perfected it—and then moving on to the next. At the end of the two or so years it takes to complete a round, Ms. Smyth lets people go if they want to work elsewhere without burning the bridge. Her willingness to support and respect individual careers has led several past employees to return to her, stronger and more loyal. When Ms. Smyth hires a promising young woman, she is particularly keen on helping her excel. But she hopes that today’s aspiring female chefs do not have to pressure themselves the way she did at the start of her career. Instead, she tells them to work in the best places they can, and learn from the best—the same advice she gives their male colleagues. 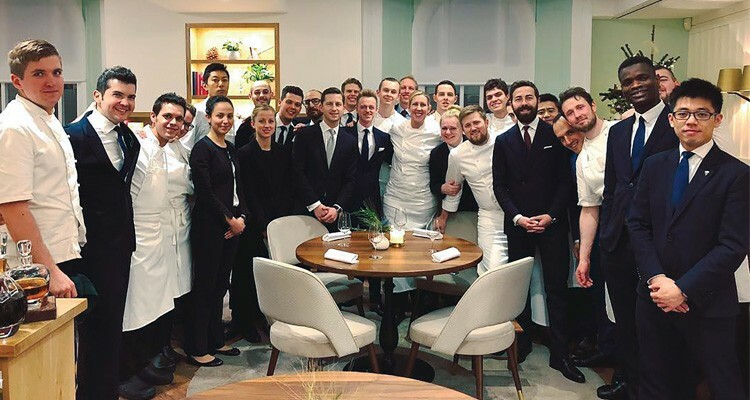 U.K. chef Clare Smyth, whose acclaimed London restaurant Core earned two Michelin stars soon after opening in 2017, opens up about how she thinks about food. Insigniam Quarterly: What makes food good to you? I always go for dishes that are not only delicious—I want the food to really resonate with people. They might not know it straight away, but they need to feel comfortable with what’s on their plate. I want people to have an almost nostalgic kind of feeling when they eat something, and to feel very satisfied by it. IQ: Is there something on Core’s menu that illustrates this? We do a potato cooked in seaweed with salted herring and trout roe and dulse beurre blanc. It is kind of a comfort food. Everybody just loves it. Often when you go to fine dining restaurants, people are intimidated by the food. But with that dish, they feel at ease. IQ: What’s your favorite food? It changes all the time. I’m always embracing the best of what’s in season. That’s what’s really cool about the food industry—you’re dealing with nature every day. You’re always doing something new, nature is different every single day. At the moment [in late September], we just started white truffle season. We’re also in game season here in the U.K.—it’s a really exciting time of the year. IQ: What do you think is underrated? Vegetables, in general. We eat far too much meat and fish in our culture, and it’s really bad for us and the environment. We do have quite a few dishes at Core that are vegetable-led. We want to show people that you can have meat as the side dish, not the other way around.